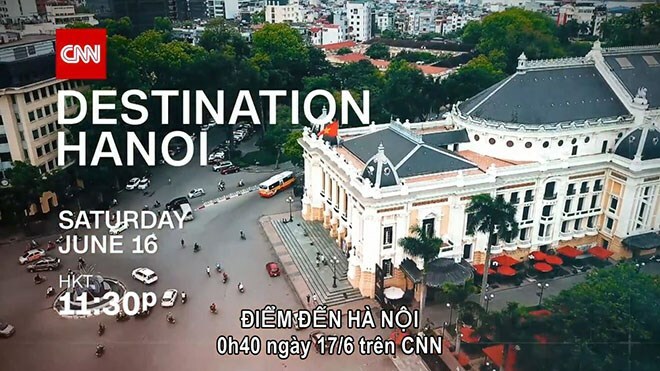 According to CNN’s broadcast schedule for “Destination Hanoi” programme in Asia, Europe, Middle East, North America, and South Asia, short clips from 3-5 minutes will be aired for 40 times on CNN Today and News Stream between June 11-15, while a 30-minute special programme will be shown 12 times during June 16-20. The programme was made by CNN early this year. The Hanoi Department of Tourism has worked with CNN since 2017. To date, three 30-second videos were aired on CNN’s channels in the five regions: Asia-Pacific, South Asia, North America, Europe and the Middle East. Three clips to be screen in 2018 are “Hanoi – Heart of Vietnam”, “Hanoi – Cradle of Heritage” and “Hanoi – History, culture and people”. The first two were produced and broadcast on the channel in 2017, while the rest was produced in 2018, featuring the city’s thousand-year-old history, relic sites and bustling streets. According to report from the municipal Department of Tourism, 62 percent of CNN subscribers said that they are aware of Hanoi’s tourism promotional campaign, 43 percent of them remembered the advertisement on television, and 43 percent of the interviewed kept in mind the advertisement on social network. Most of the interviewed said that Hanoi has many alluring tourism spots and they want to visit the capital city once. Hanoi served more than 13 million tourists in the first five months of 2018, a year-on-year rise of 10 percent. Tourist attractions in Hanoi include Thang Long Imperial Citadel, Huong Son relic site, Vietnam Museum of Ethnology, Ho Chi Minh Mausoleum and Ngoc Son temple. This year, Hanoi expects to serve more than 25.4 million holidaymakers, including 5.5 million foreigners, and gross some 75.78 trillion VND (3.33 billion USD) in revenue.